On December 4th, 2012, 5 brand new episodes from the My Little Pony: Friendship is Magic series were released on DVD. 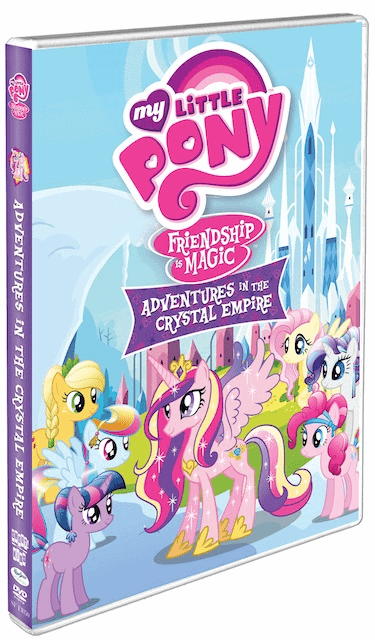 This DVD is titled Adventures in the Crystal Empire, and was released by Shout! Factory. If you have a child that loves My Little Pony, this is a perfect stocking stuffer for Christmas. As I expected, my 4-year-old daughter giggled with excitement when I pulled this DVD out of its bubble mailer. I played with Hasbro’s My Little Pony toys when I was a little girl, so I love being able to share the updated My Little Pony stories with her. The episodes on Adventures in the Crystal Empire are enjoyable for the whole family. Zoe was especially excited for the male ponies that made appearances in these five episodes. She owns several of the pony toys from Hasbro, and I hope that with the gaining popularity of this TV series we’ll see boy pony toys, too! As with the previous episodes I’ve seen from the Friendship is Magic series, the ponies teach their viewers how important it is to work together to solve problems. In The Crystal Empire parts 1 and 2, Twilight Sparkle is on a special mission for Princess Celestia to help a magical empire. In order to find the Crystal Heart, which will save their empire and her own, she needs her friends to keep everyone else occupied at the Crystal Faire. I especially liked these two episodes because they featured a catchy new song; I felt like I was watching a musical! In Sonic Rainboom, Rainbow Dash has entered a competition to win a a day with her idols, The Wonderbolts (flying ponies who perform aerobatic feats). Rainbow Dash encounters a group of ponies that bully her into thinking she cannot accurately perform her moves, but Rainbow Dash’s friends quickly come to her defense and say that she will be in top form for the competition. Luna Eclipsed will most likely be Zoe’s favorite episode on this DVD; she loves the character Luna/Night Mare Moon, and this episode is all about her. During a celebration called Nightmare Night, Luna needs Twilight Sparkle’s help to make all of the other ponies like her, despite the scary legends surrounding her. In It’s About Time, Twilight Sparkle tries to avoid a disaster when she’s visited by a future version of herself that looks very rough around the edges, wearing an eye patch and having a singed mane. The twists and turns in this episode are hilarious! Sing Along You and your child can sing along with “The Ballad of the Crystal Ponies”; the words are displayed on the screen as the music and video play! Coloring Sheet In order to access this, you’ll have to insert the DVD into your disc drive, and double click on the file called Coloring_Sheet to download and print out. I loved the My Little Ponies when I was a girl so it’s fun to share them with my daughter, too! She is pretty good about sitting through a whole movie now, so I bet she’d like this! This looks so cute. I used to love playing with My Little Pony ponies when I was younger! My 4 yr old niece would love this! Thanks for the review. I used to love My little pony when I was little.. When I had kids I dreamed about being able to sit down with my little girl and watch movies like this together and of course I had a boy!!!! AT least I have nieces! !